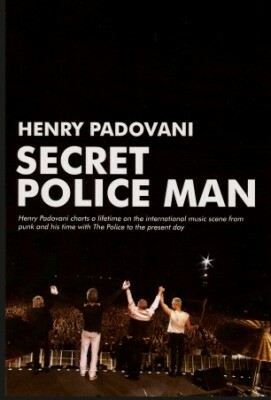 Sting.com > News > Secret Police Man by Henry Padovani - now available in English - order your signed copy today! Secret Police Man by Henry Padovani - now available in English - order your signed copy today! How, newly arrived in London, he met Stewart Copeland and jammed with him at his squat in Mayfair. The fateful day that together, dressed in leather drainpipes and dark glasses, they "put on a show and adopted the pose of dangerous rockers" to impress Sting who had just arrived from Newcastle in his dungarees with baby Joe in a travel cot. Stories of the early days touring with The Police in Europe and at the legendary Mont-de-Marsan punk festival. How he came to be on probation at Clerkenwell police station and was given special dispensation to turn up late to sign the register on the day The Police were recording their first single, Fall Out. And how, after the arrival of Andy Summers, Sting had to break the news to Henry that they wanted to carry on as a three-piece without him. Being voted "Ligger of the Year" by City Limits magazine, and his detailed descriptions of life from within the inner circle of the London punk scene where he would be out every night watching bands such as The Damned and Generation X at clubs such as The Roxy. Bizarre escapades during the three years he spent touring with Wayne County and The Electric Chairs whilst Wayne was in full transformation into "Jayne". Forming his own band The Flying Padovanis, including the infamous cream-cake fight backstage in Paris with the Pretenders. His close friendships with the doomed Pete Farndon of the Pretenders and with Topper Headon of the Clash during their descents to drugs hell. Memories of Paris and Amsterdam as vice president of the IRS record label where he launched REM, The Cramps and Lords of the New Church, amongst many others. Treating Sting and Trudie, and Bono and Ali, to join him in a box at the Stade de France for the World Cup Final where after the match they bump into Henry's heroes, the whole of the Brazilian football team, who forget for a second the loss of the match to the French, and are star-struck in Bono's presence. Coaxing a cantankerous Luciano Pavarotti away from his house where he insists on having a long lunch followed by a siesta, back to a local hotel where a stressed out producer is tearing her hair out and a large TV crew is threatening to walk out after waiting to film him singing and presenting an award to Zinedine Zidane. Performing "Next to You" alongside The Police in front of 80,000 people at the Stade de France, where he is given a dressing room in the anti doping control room. All these stories, and many more, can be found in Henry's book: "The Secret Police Man". See the website at www.secretpolicemanbook.com for more information and ORDER YOUR COPY TODAY!